Heat up your Jeep Grand Cherokee, Commander, Wrangler, Liberty, Cherokee, Compass and Patriot with a steady flow of cold air. 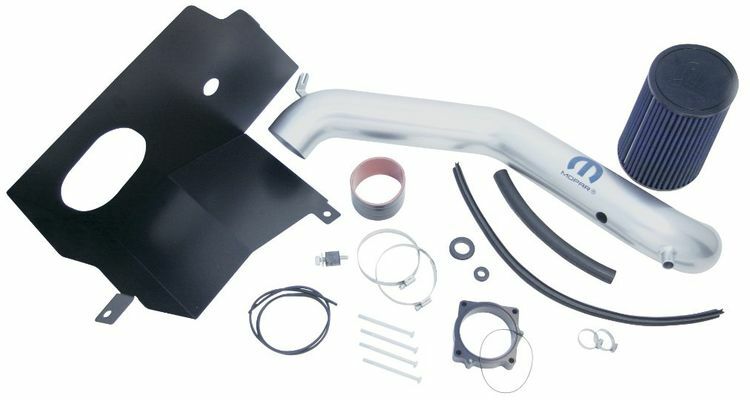 This bolt-on system is designed to allow cooler outside air in through a directional cone filter and funnel it directly into the intake manifold. These kits provide noticeable horsepower and torque gains under varying atmospheric conditions. CARB-approved E.O.#D-265-22. Kit includes all mounting hardware and a washable/reusable filter. Do not oil dry media filters. Please select Engine & Model above. Makes the HEMI sound so much meaner and definitely adds more power. Easy to install! This was an immediate improvement in throttle response and horsepower. We could notice the horsepower gain the soon as it was installed. 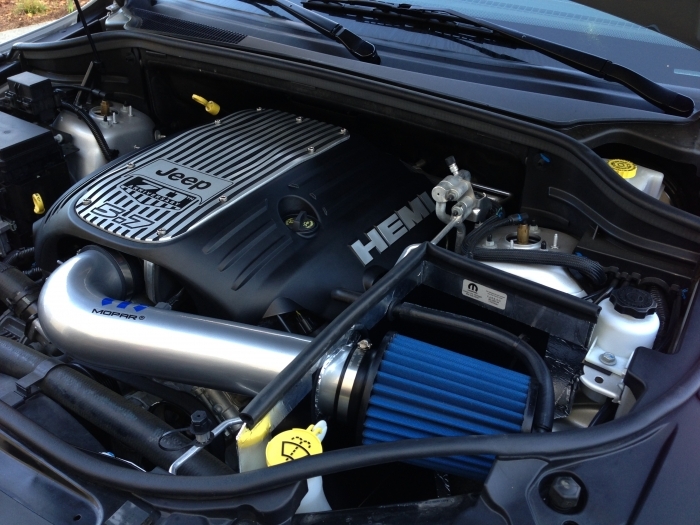 It also gives the HEMI a much throatier sound exposing the horsepower that it has locked inside a stock air cleaner. ProsWould highly recommend for anyone that wants increase horsepower. Not very difficult to install with minor tools and a little bit of knowledge. Looks great installed. 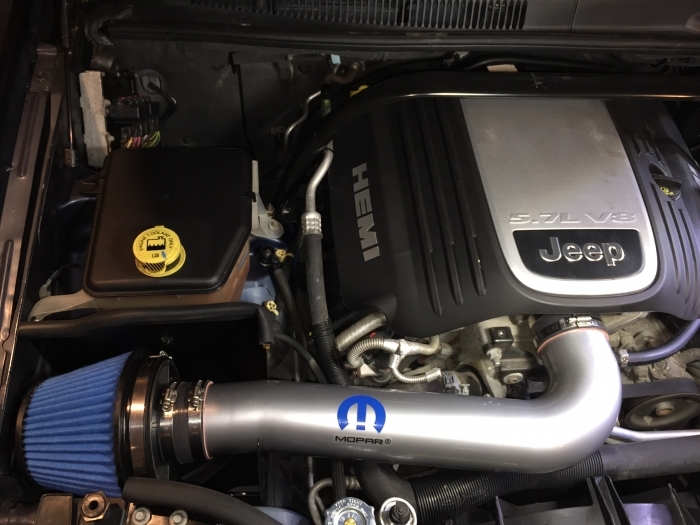 The Mopar CAI was a great addition to my 2011 Grand Cherokee with the 5.7 Hemi! The engine sounds even more spectacular, and throttle response seems better. With the better air flow the engine seems run cooler and get slightly better MPG despite my more frequent accelerator mashing. Installation was fast, easy, and the kit came very well package with ALL the necessary hardware, and easy to follow directions. Final install is very clean, very sturdy, and looks as if designed for this Jeep (it was). The first time I put my foot into it, I laughed pretty hard because it was so much louder than the stock air intake. It is loud when you get on it, but much better behaved at normal driving throttle positions (sounds like stock). As far as power, maybe in a perfect, ideal world, with a perfect, ideal Jeep, you might gain 25 horsepower; my guess would be 5-10 that you'll ever actually notice (I would say the gain is comparable to the loss you feel when the a/c is on to off). My gas mileage has definitely not improved, but I don't know if this is because I'm on it more, to hear it roar. It also looks nice in the engine bay. Product arrived well package. Instructions are thought out and easy to follow. Took me about 35 minutes to install, not including disassembly. Added some power but sounds awesome when you mash the go pedal!!! 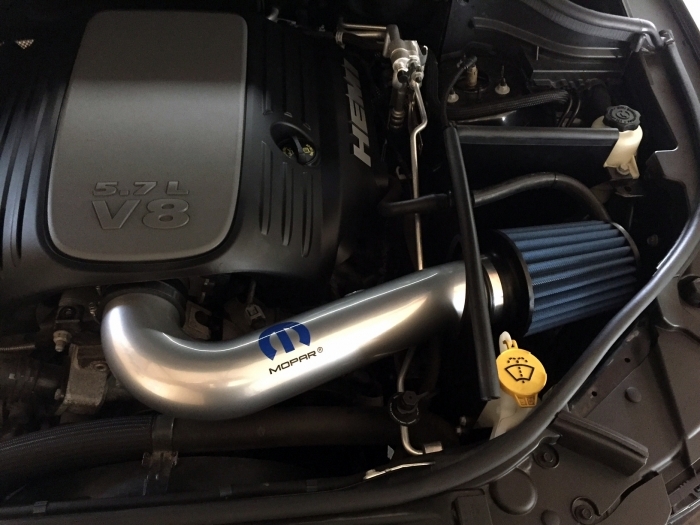 ProsEasy install Awesome sound Dresses up the engine bay CARB Approved, California! Fit and finish is spot on. Install was fairly easy as this was not my first CAI install. Finished product looks great under the hood and substantially smaller than the stock configuration. Throttle response is definitely quicker and throws off quite the noticeable growl when getting into above 1/2 pedal. Too early to tell if mileage improves but I didn't buy it for the fuel savings lol. Your service is Superb very satisfied when ordering from your store. The Cold air intake makes a difference engine idle is very smooth . Acceleration is better less effort on the gas pedal than with the factory air intake. fits perfectly on my 2014 Grand Cherokee V6. Dont get the sound unless you push it and I do notice better pick up. Easy to install about 90 minutes. Looks Awesome too! Fits perfect, great new throaty sound, better gas mileage and definitely more power. 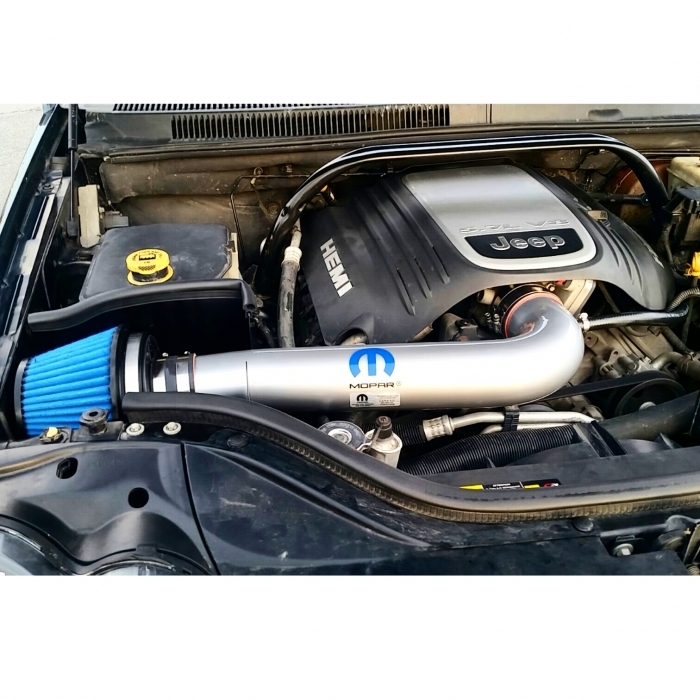 I love the addition of my new Mopar air intake.Love the extra power and sound it adds to my 2006 Jeep SRT8,and best of all I retain my factory warranty! ProsGenuine Mopar part that doesn't cause the dreaded check engine light. 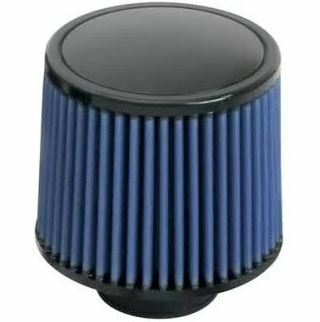 I also don't have to worry about any warranty issues from the dealership that other air intakes can cause.